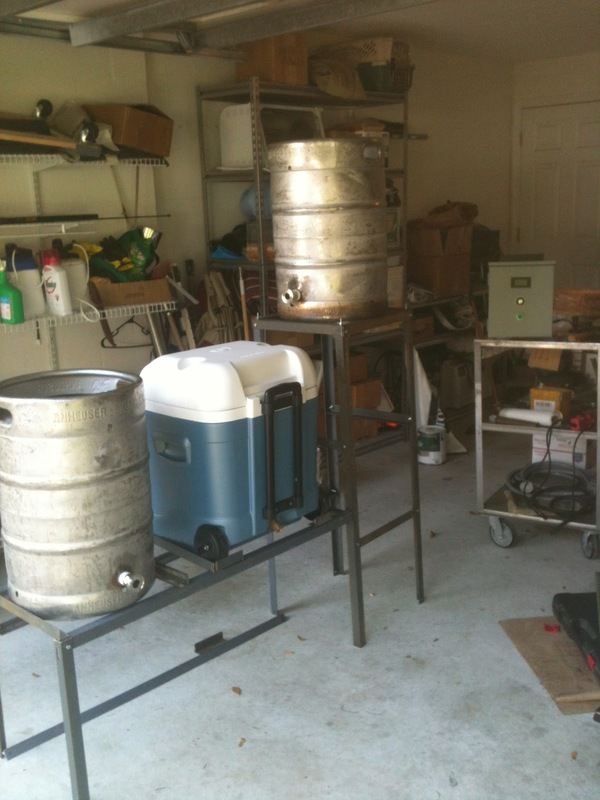 A journal of my home brewing activities and hobby. Beer and Wine..ummmm..tiny little bubbles..
Getting Closer to Brew Day! Coastal Extreme Brewing Co Wort Give Away! Please help this craft brewery grow and thrive...Donate Today! It seems like forever since I made a post. Life sometimes just takes over and time flys! 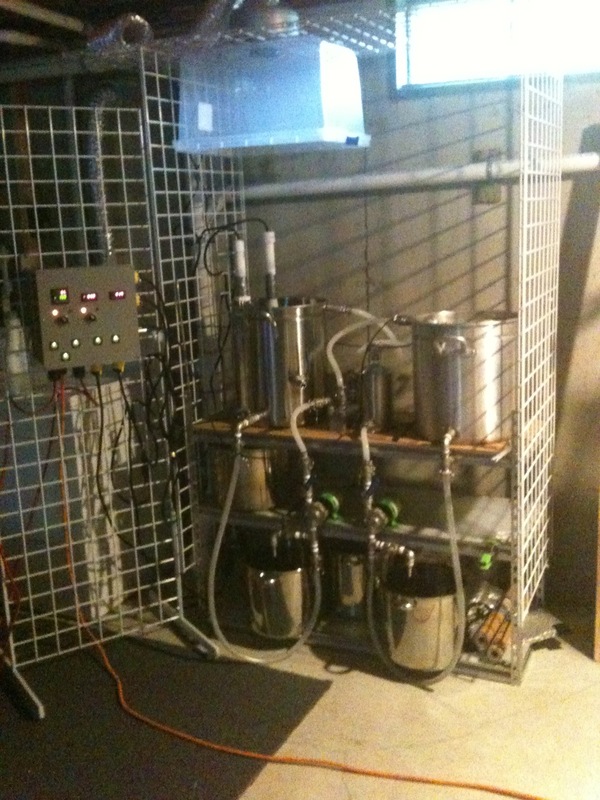 We sold our house and moved a while back and I also ended up selling my electric brewery too. That makes 3 home breweries made and sold in the last 3 years. At this time I have started to put together electric brewery number 4 , and hope to share with all my readers as much as I can on this build. I'm now waiting for parts to be delivered then the build can start. I hope you can join me! Hope you read the latest issue of BYO as my brew rig was featured in it. Thank to all the BYO people for making it happen! On another note.....Just to let everyone know... if you have signed up for my newsletter...I thank you for doing so. I have to let you know that I have not sent out any issues yet as I am waiting until I have a reasonable amount of sign ups before starting. As all of you probably know....I have a very busy life and updates to this blog don't seem to happen often enough. I truly apologize for that. Please note that your email addresses are safe and secure and I don't share them with anyone. Like I said....we will be moving this Saturday to a way nicer location in the country. I have the go ahead to upgrade the electrical service to suit my needs...and we all know what that means....! yayyyyy!!!! 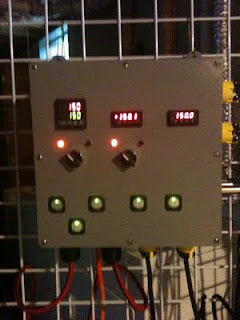 240/30 amp service is a week or so away....and so is the re-design and upgrade of my brewery! The upgrade will be very easy for me as I already have the required components that's needed. 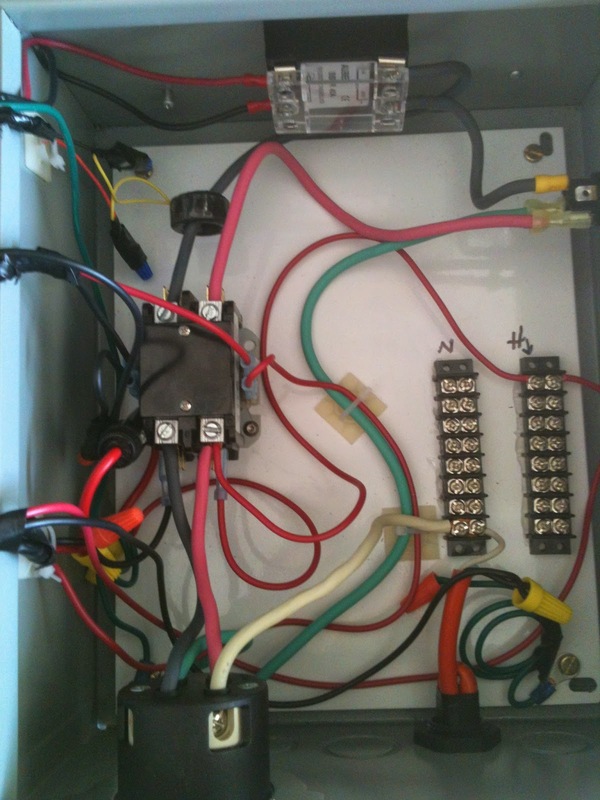 I'll get my licensed stepson to do the wiring and we'll be all set! I'll do the best I can to document the process and get it posted. I hope all of you can be patient as moving is always a big chore. I visited my friend JD today as he was brewing up one of his delicious Pale Ale's. Anyways.....getting late....and i'm tired....sorry ....no pics today....wayyyy too busy getting ready for the move.. The maiden voyage brew session was successful but with a couple minor glitches to correct. I had cavitation issues with the pumps but managed to get them primed. Overall the session went real smoothly and my brew buddie JD was on hand to help out. 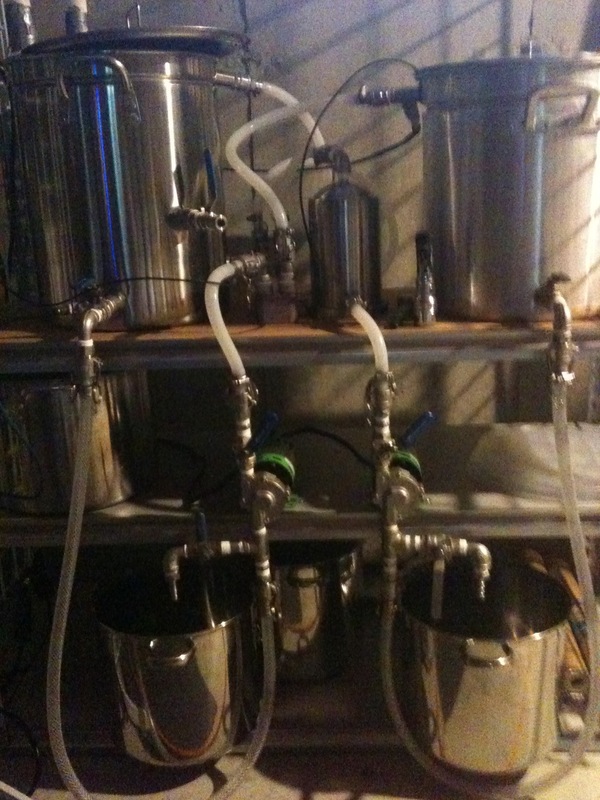 Since then I have changes a couple of things with the brewery's plumbing configuration and installed the Blichmann easy connectors on both pump's suction lines. I also re-installed the drainage plumbing to be on the pumps out going side and added a HLT above the mash tun to hold hot liquor for the sparge. I guess you can say that I now do a modified batch-fly sparge using 3 vessels. Using the 30 plate heat exchanger instead of an installed coil for the HERMS system was a huge improvement on performance and it serves double duty during the wort chilling process as well. I have since brewed on the system 5 times and it is performing very well. It is real easy to use and the results have been better that I anticipated! Seems that the quality of the beer has improved quite a bit too! Yayyy! 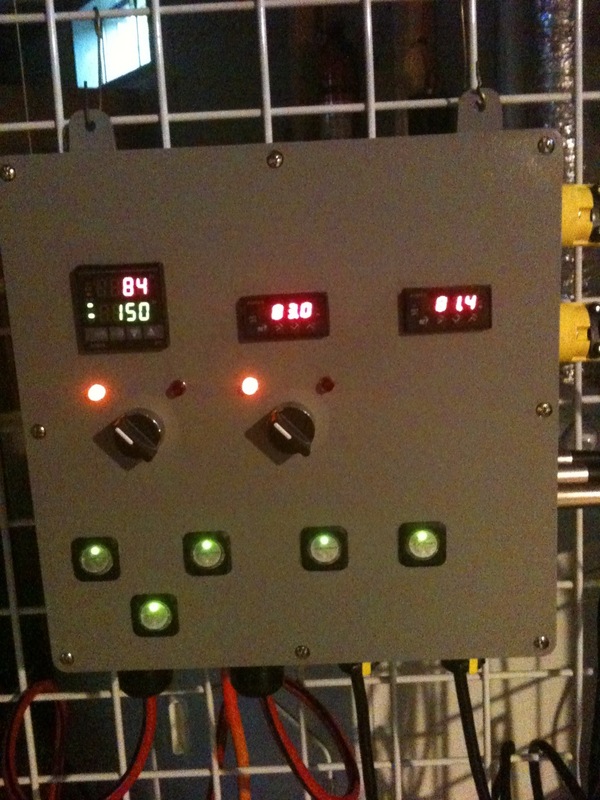 Below are a few pics of the brewery as it stands now....but I already have a couple minor changes in mind which concerns the control panel and the SSR wiring....more on that later....! 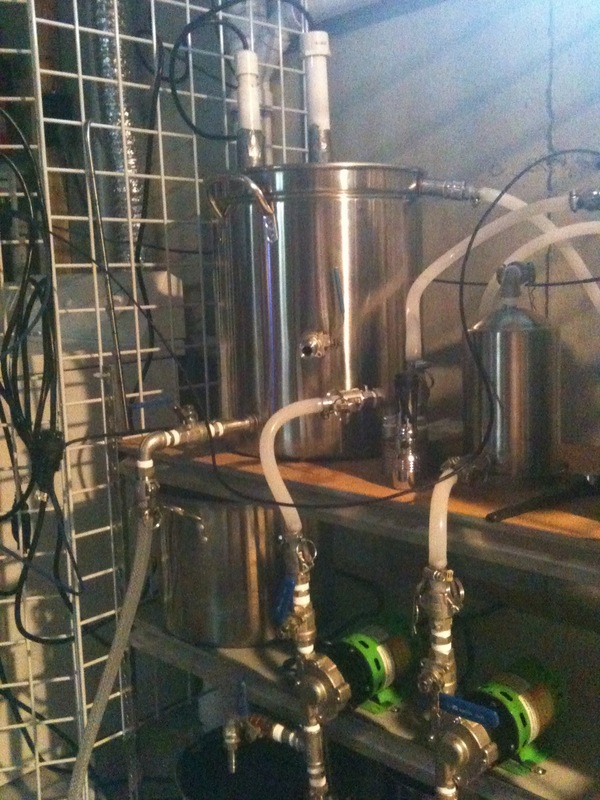 This is a shot of the home made sparge and liquor return arm. The sparge arm in action returning the wort to the top of the mash. Running off the wort into the boil kettle. Wort coming up to a boil using 3 heatsticks. While the wort is boiling, the mash tun is cleaned of spent grains and filled up with 60 lbs of ice and enough water to prime the pump and start the cooling process. Here's where I had to change the plumbing for the pumps. The drainage system is very useful to purge hot or cold liquids. It also allows me to capture quite a bit of wort that gets trapped in the system. I can then return this wort to the boil kettle. This is the output side of the chilling process after the boiling of the wort has been completed. This is a 1 pass operation and cools the wort from 200+ degrees F directly into the fermenter at the desired fermentation temperature. The temperature is controlled by either slowing down or speeding up the flow of the hot wort which is being pumped through the plate heat exchanger. The first time I used it, the wort was cooled too much (48 degF) and I had to wait for it to warm up to be able to pitch the yeast! I just added the thermometer so I can now regulate the exiting temperature of the wort. The entire cooling process takes 15 minutes from the boil kettle to the fermenter in 1 pass. Well that's it for now as I have to go downstairs and bottle the Imperial Rye IPA and check up on the Belgian White that's now fermenting. My next session will be next week and we'll be doing a Hefeweizen complete with decoction. Sorry for not being around but i've been busy putting together a new brewery...this time an electric one so I can brew indoors during the cold RI winters! 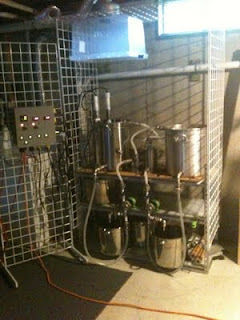 It is a 2 vessel brewery that recirculates the wort and mash and sparge water around itself to produce a suitable wort. 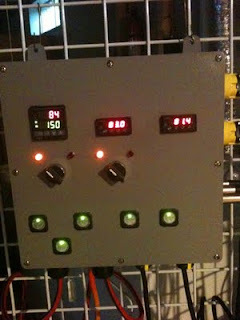 I finished testing it today and performed a final cleaning of all components, and it is now ready for i'ts maiden brew session. I'll be brewing with it before the week is out. I'd also like to thank Kal over at theelectricbrewery.com for his inspiration and insights concerning the build. I did implement a few of his ideas for my system but not many! Below are a few pics of today's testing session and final cleaning. I'll be adding more pics during the brewery's maiden voyage soon! Last Saturday I went down to Newport to visit Coastal Extreme Brewing Co., home of the Newport Storm beer brand. They were conducting their annual brew session of their 2011 beer for this year and the homebrewers of the area were invited to come and take the tour, sample some great brews in the sampling area, then take home the left over wort to boil and ferment themselves! For the '11 seasonal beer, they only kept the first runnings and gave away the second and third to us homebrewers. This year's specialty beer was a collaboration of Rhode Island's best commercial brewers and it went well! It will be released in Nov 2011 and is a BIG beer! Can't wait to try it! The brewery tour was a lot of fun and very informative and was a bit of a history lesson not only about the brewery, but also about the history of brewing in Rhode Island, as this state is rich in brewing history! The tour was conducted by Laura Blackwell, and she was great at answering our questions and was very entertaining too! Great job Laura! Coastal Extreme also brews and distills their own line of rum by the name of Thomas Tew Rum. You can learn more about the brewery and about Thomas Tew Rum by visiting their website HERE. 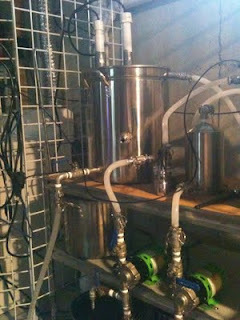 The brewery even allowed a few homebrewers to bring their boiling gear and boil their wort at the brewery! I managed to bring home 10 gallons of wort, one from the second runoff and one from the third. I brought it all home and with the addittion of some extra specialty grains, I boiled up a Dopplebock using the first runnings, and with the second, I bolied up an Oktoberfest. They are fermenting away as I type. I also ran in to a couple of fellow RIFTers there and we had a great time discussing our plans for the wort. I managed to take a couple of pics and they are shown below. I'd like to thank everyone at Coastal Extreme Brewing for their generosity and hospitality. It was a great day! Below, members of the South Shore Brewing club boiling their wort. 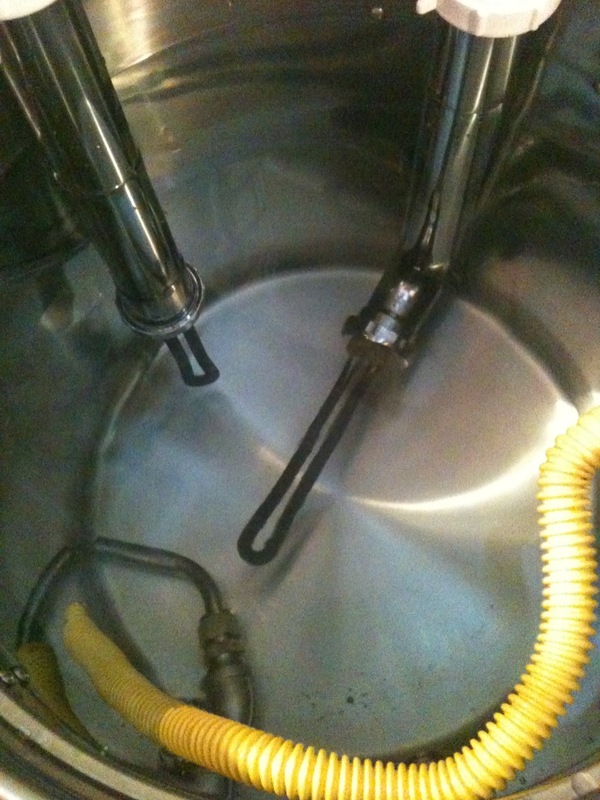 Below: View of the mash tun and boiling kettle. I need to get a few of these...! Here's John showing off his damaged finger. Ouch! 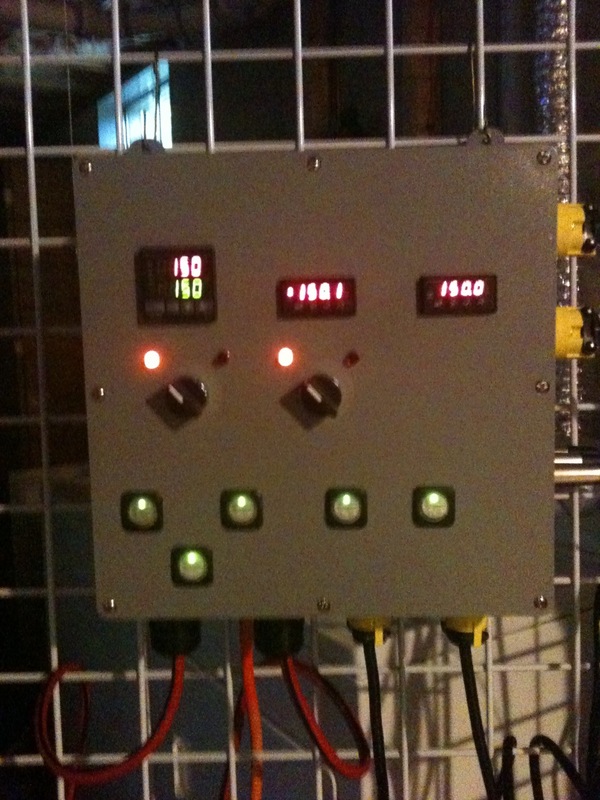 Well that's it for now...I'll have some new pics of my new electric brewery posted soon and some more informative information about how it all works.